The U.S. Postal Service has announced new stamps to be issued in 2016, and one of them features a teacher with a Sacramento connection. 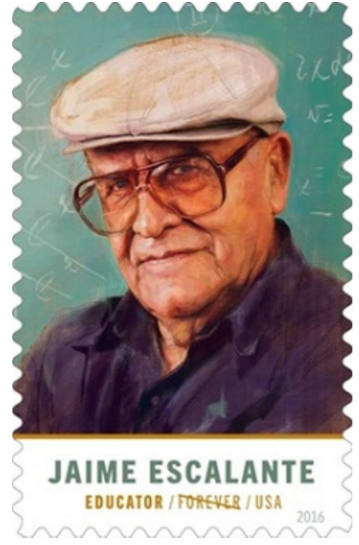 The new stamps, to be issued throughout the year, include stamps that pay homage to “Star Trek,” songstress Sarah Vaughan, child star Shirley Temple and the late Jaime Escalante, who taught in both Los Angeles and Sacramento. High school math teacher Escalante, a Bolivian immigrant, taught at high-poverty Garfield High School in Los Angeles from 1974 to 1991, building a first-class math program with high rates of student success on the Advanced Placement calculus exam. In his 60s, Escalante taught from 1992 to 1998 at Hiram Johnson High School in Sacramento, where he demanded excellence from his students. “When students are expected to work hard, they will usually rise to the occasion, devote themselves to the task and do the work,” Escalante said. His story was told in the 1988 film “Stand and Deliver,” starring Edward James Olmos. After a long battle with cancer, Escalante died March 30, 2010, in Roseville, where he was staying with his son. The stamp art that features Escalante is a digital illustration that has the appearance of a painting. It is based on a photograph taken of Escalante in a classroom. A date when the stamp will be available has not been announced. “Our stamps articulate the American experience through miniature works of art,” said acting stamp services director Mary-Anne Penner. I proudly welcome Jaime Escalante to The Hall of Bolivian Fame! This entry was posted in Bolivia and tagged competitiveness, Jaime Escalante. Bookmark the permalink.